IntraHealth's HNP team recruited almost 700 new members throughout the Lake Zone in a single month. Photo courtesy of Auson Kisanga. “As you can see, my boss and I are the only two health workers serving at this facility,” a nurse named Martha told us at a local dispensary in Tanzania’s remote Geita region. We talked with over 1,000 health workers like Martha. 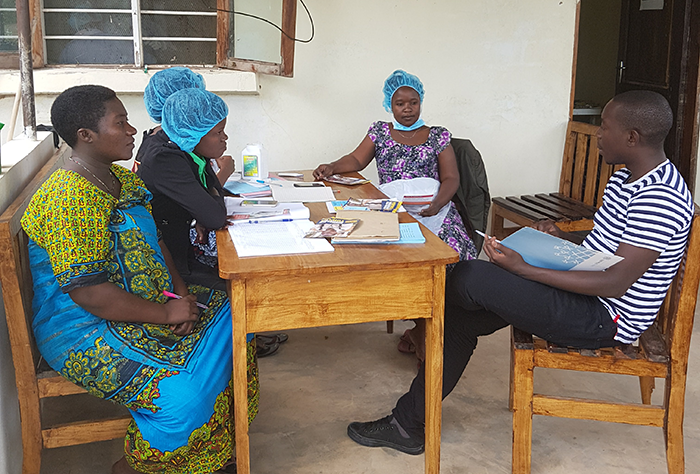 Our team was in Tanzania’s Lake Zone to visit rural health facilities and recruit health workers like Martha to the Health Network Programme (HNP), which connects health workers to one another via mobile phones. Through a closed user group service provided by Vodacom (a leading mobile network operator in the country), participating health workers can call and send each other SMS text messages for free. They can also access key professional development websites without incurring data charges. Throughout November 2016, our IntraHealth International HNP team drove long distances and spent long days visiting 51 hard-to-reach facilities in Geita, Shinyanga, and Simiyu regions. We met over 1,000 health workers who, like Martha, are often working with few resources and struggle to provide the care their communities need. The region is a focal point of Tanzania’s Big Results Now! initiative (a multisectoral strategic approach adopted by the government of Tanzania to improve public services), as well as many health interventions in the country, including HNP. But why did our team travel all the way from Dar es Salaam to these faraway facilities, instead of simply collecting the health workers’ information from the Ministry of Health or from health worker councils? We needed to see and experience the challenges these health workers face on the ground when it comes to communication systems and access to information. We needed to meet and engage with them to hear their ideas of how HNP could serve them better. So we talked with health facility staff (sometimes individually at their convenience, so as not to disrupt service and operations at a facility) and listened to their feedback. Health workers want a simpler way to connect with fellow practitioners, but cost is often a barrier. We learned that health workers want a simpler way to connect with fellow practitioners, and that cost is often a major barrier. We also learned that many were excited to have access to the Global Health eLearning center, which will allow them to foster their technical skills at their own convenience and without incurring data charge. But they also want the courses and certifications offered there to be recognized by the nursing council as part of their mandatory continuing professional development. That is something we can work on going forward. Throughout the month, regional and district medical officers helped spread the news about the program and signed up health workers from districts and facilities that we were not able to visit. We gave them blank registration forms and they returned them, all filled in. Their guidance and support helped a great deal in shaping our approach and in recruiting new health workers to HNP. In the end, 693 health workers chose to become new HNP members, 501 (or 72%) of them nurses. The journey made me understand real health workers’ working environments and needs, especially in Tanzania’s rural areas. The experience and lesson learnt will serve as useful reference in our ongoing efforts to deliver value to our country’s health workers and contribute to better health care for all Tanzanians. The Global Health eLearning center is a partnership of the US Agency for International Development and the Knowledge for Health project, for which IntraHealth is a partner. Throughout November 2016, our team drove long distances and spent long days visiting 51 hard-to-reach facilities in Geita, Shinyanga, and Simiyu regions. Image courtesy of Auson Kisanga.